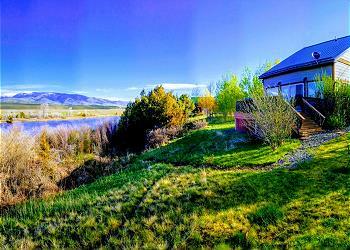 Wonderful riverside cottage overlooking the Yellowstone River. 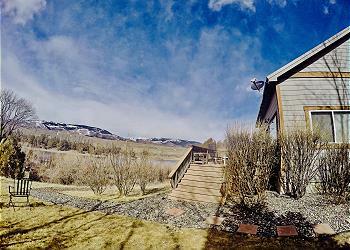 Plan your day of fishing or floating on the Yellowstone to begin or end right at your back door! Newly upgraded dishes, linens and more! 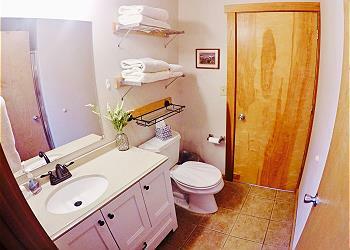 The home has three bedrooms and two full baths, plus a portable twin mattress, just in case! 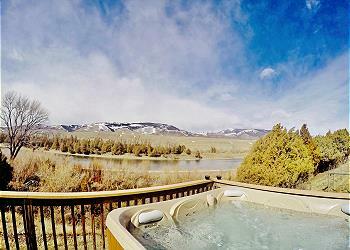 The home is set up with wireless Internet and a hot tub! This home has a 5 night minimum during the holidays. 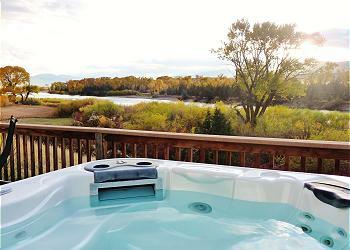 BRIEF DESCRIPTION: This three bedroom, two bath cabin in the Paradise Valley looks out over the Yellowstone River. 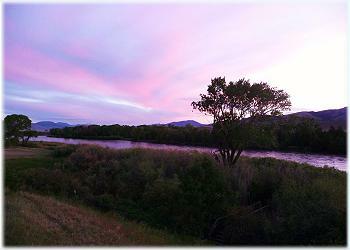 Bald eagles can be seen quite often in the cottonwood grove across the river. 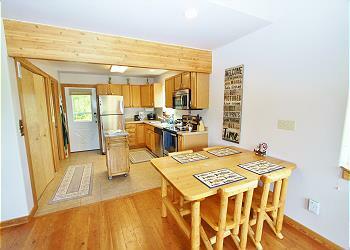 Guests can walk out the door and go fishing or floating right from the house! 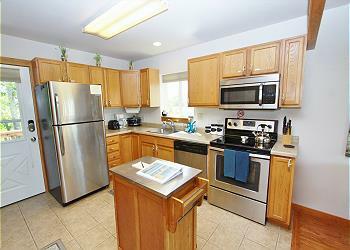 The home has a tasteful, western style with beautiful wood and tile floors and some unique artwork to enjoy. 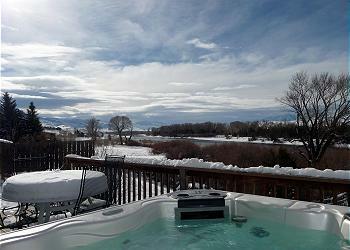 An extra bonus, the home has an outdoor hot tub. 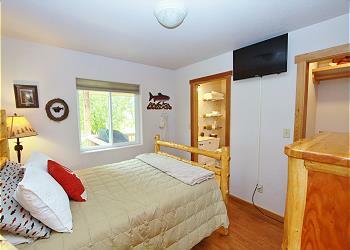 BEDROOMS AND BATHS: The master bedroom is downstairs, with a queen size log bed and a full bath with a stall shower. This bathroom also opens to the kitchen. 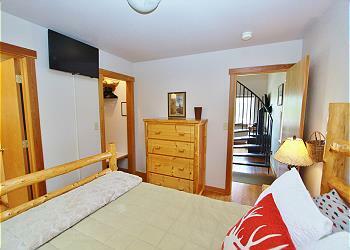 The master bedroom is set up with its own 32" flat screen TV and satellite service. Up the spiral staircase leads you to two more bedrooms. 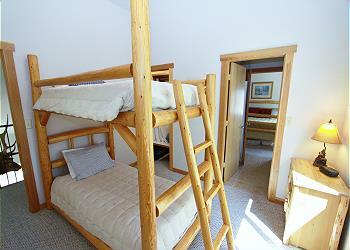 There is one bedroom with a queen size log bed and another bedroom with a log frame bunk bed for the kids. 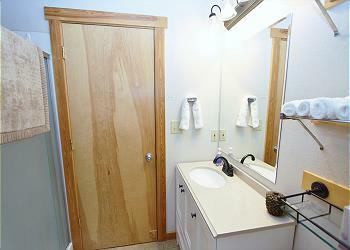 A full bath with tub and shower is shared by these two bedrooms. 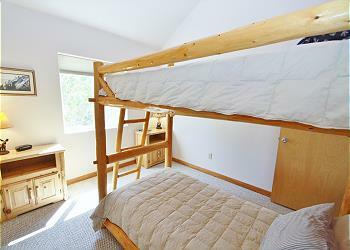 There is also a portable mattress that can be set up if the sleeping arrangements require it. 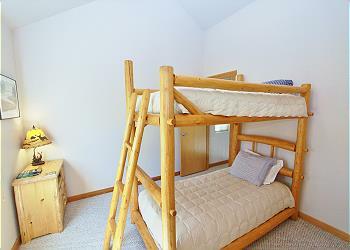 The home can accommodate up to six guests. KITCHEN AND DINING AREA: The complete kitchen, with stainless steel fridge, dishwasher, range, microwave and all the cookware is open to the dining area and living room. The dining room table will seat six, or head on out to the deck and enjoy your meal while enjoying the river view. 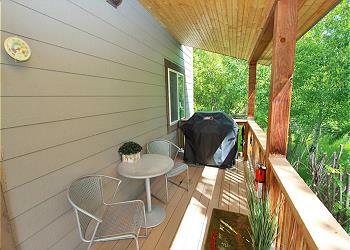 There is a gas barbecue on the deck for outdoor cooking. 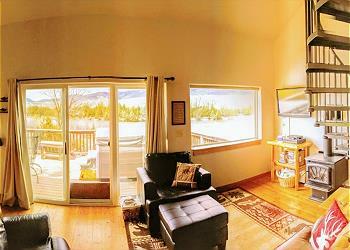 LIVING ROOM: The living room has cozy and comfortable leather furniture, views out to the river, a flat screen television with satellite service and DVD/CD home theater sound system and a gas fired woodstove. The home has a great collection of movies for the DVD player -- everything you could need! 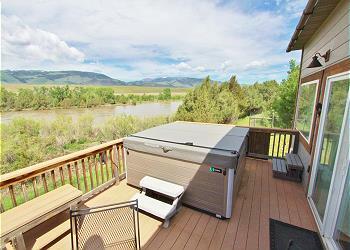 SETTING, ACREAGE, VIEWS: Yellowstone River Overlook is in a small neighborhood of homes in a beautiful Paradise Valley setting. 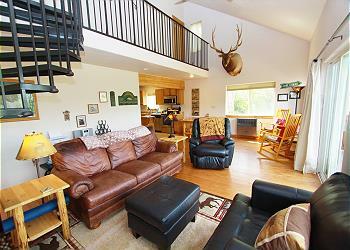 The cabin has private river frontage and wonderful views of the Absaroka Mountains. 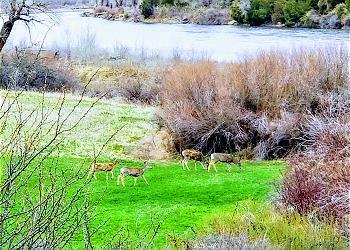 Across the river there are no neighboring homes, just the river and some grassy fields and Route 89 to Yellowstone Park is just within sight. 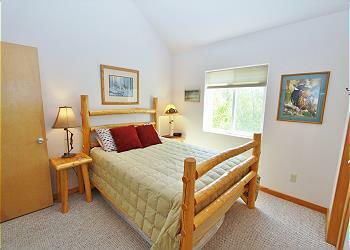 DISTANCE TO AIRPORT: The Bozeman airport is about an hour drive from the cabin. 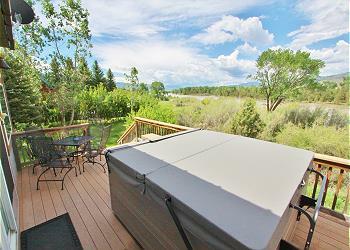 ACTIVITIES NEARBY: Fishing on the Yellowstone River is literally out the back door. Rent a driftboat, canoe or raft and plan your own adventures on the Yellowstone. 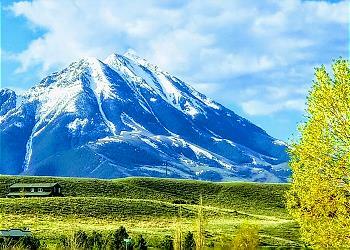 Other nearby activities include hiking, biking and horseback riding and Yellowstone Park which is just 45 minutes away. Chico Hot Springs, with world class dining and great soaking, is just a few minutes down the road. The town of Livingston is 20 minutes away with a great selection of restaurants, galleries and shopping and Bozeman is just over the hill. Winter visitors can enjoy cross country skiing in the beautiful Absaroka Mountains and Yellowstone Park. There is so much to do! We haven't had a trip out west in years and when the opportunity came we jumped on it. We LOVE THIS PLACE! 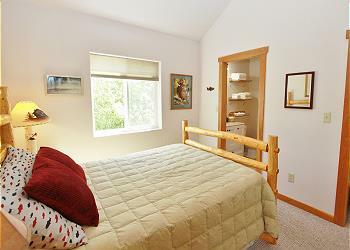 The rooms are well appointed and the entire place felt like being home. 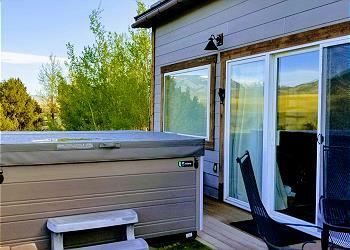 The new hot tub and all of the upgrades in this house made it super convient to stay and play in. And the walk down to the river was amazing. - Thank you for the amazing new memories. Pray cabin was the perfect getaway for my husband and I. We were able to bring our dogs along with us and relax. The hot tub was a huge plus! We would definitely make the trip to come back and stay. This was my first vacation home rental and the folks at Mountain Home really went above and beyond to make sure I had all the information I needed and kept in contact with me throughout my visit. The house itself was lovely, very clean, orderly and completely met my expectations. It was an added benefit that I was allowed to have my dog stay during the rental. 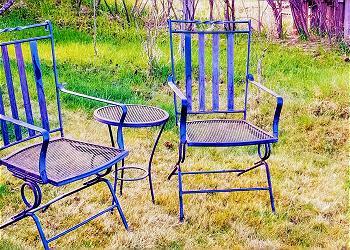 I had no problems with any maintenance issues and knew who I could contact if a problem should arise. I hope I will have a chance to rent from this company again in the future.